Peek is a project spearheaded by the London School of Hygiene and Tropical Medicine in partnership with several other medical organizations that hopes to bring better medical care to the third world. It's currently being tested on 5,o00 people in Kenya who might not otherwise have access to an eye doctor, and it's damn close to providing all of the same service. 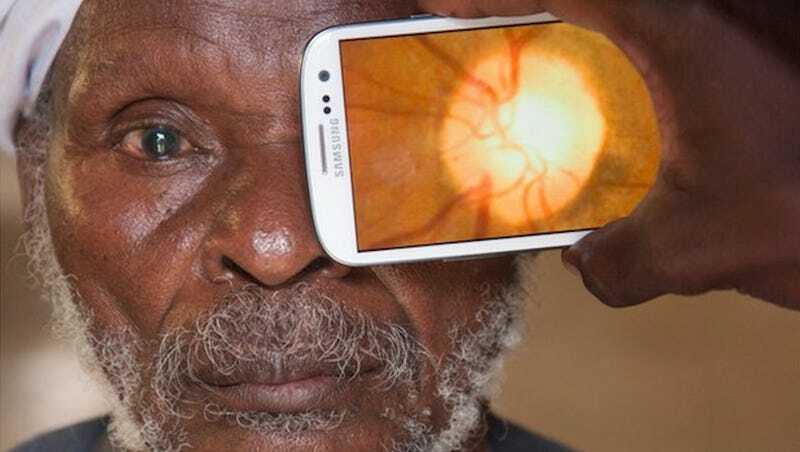 The app uses the smartphone's camera to scan the eye for cataracts and activates the camera flash to scan the back of the eye for disease. It also employs a shrinking letter on the screen to conduct eye exams in the field. Examiners keep track of the patients by storing their records on the phone, where the GPS chip also logs their location. The product is still in the trial stages, but things look promising. The research team says that results of an on-going study on the efficacy of Peek's eye test have been encouraging, and the International Agency for the Prevention of Blindness calls the app "a huge game changer." You can try it yourself by contacting the Peek team directly. Or if you're really interested you could probably join the small army they hope to deploy around the developing world.